Get A Powerful Battery Electric mower for Just $50! Registration is open now! First come, first served. South Pasadena and The American Green Zone Alliance (AGZA) have teamed up to offer fifty brand new in-the-box 36V cordless electric mowers exclusively to residents of South Pasadena at the give-away price of just $50! You don’t even need to exchange a gas mower to qualify! Just be among the first fifty residents to register and pay, then pick up your new quiet zero-emission mower at Garfield Park on Saturday, February 11th. AGZA reps will be on site to show you the key features and simple charging, and let you try it out on the grass. And they’ll help load your new mower into your vehicle too! This is not a toy mower. The Greenstation‘s tough 18” Lawn Badger comes packed with all the features you expect in a quality mower, plus it’s powered by a robust integrated 36V battery and quiet, super-efficient electric motor. 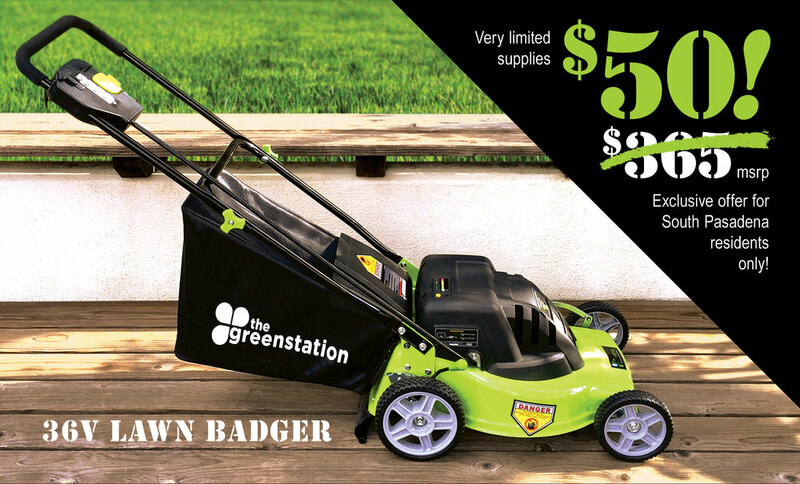 The Lawn Badger requires no gas or oil, needs virtually no maintenance, and costs just pennies per week to operate. It charges in any standard outlet and will run 35 to 45 minutes on a single charge, making it ideal for small and medium residential lawns. NOTE: $100 price mentioned in the video below was for 2016 mower exchange. AGZA and the City of South Pasadena are now making this same mower available to South Pas residents — without a gas mower trade-in — at the give-away price of just $50! First come, first served. One mower per household for residents of South Pasadena only. Take a little of South Pasadena's cleaner, quieter Green Zone initiatives home to your own yard today. Your neighbors will thank you!